A polyp is a benign mass, meaning that it is not malignant or "cancerous" and does not often metastasize (spread to other tissues). Nasopharyngeal polyps develop in the middle ear, which is the compartment just behind the eardrum. 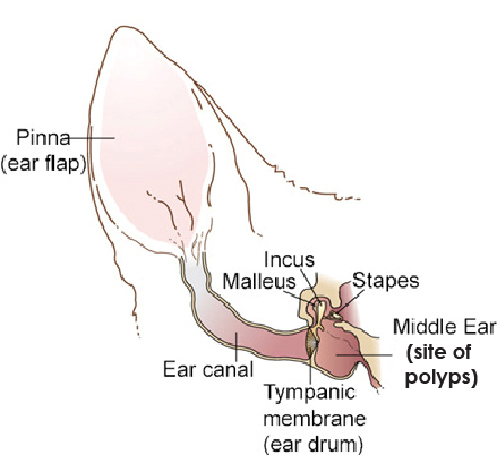 As the polyps enlarge, they grow down the Eustachian tube, the tube that connects the middle ear to back of the throat. As the polyps continue to expand, they may partially block the cavity at the back of the mouth. What are the symptoms of nasopharyngeal polyps? "...affected cats usually develop a distinctive snorting sound as they breathe." The main symptom of nasopharyngeal polyps involves breathing. The polyps obstruct the passage of air so affected cats usually develop a distinctive snorting sound as they breathe. Secondary bacterial infections can develop due to the blockage and accumulation of secretions. If this occurs, the cat develops nasal discharge and sneezing. The discharge may be clear or have some blood in it. The cause of nasopharyngeal polyps is not known. Some researchers believe that they may result as a response to chronic inflammation. Others think that a link exists between infections and the development of polyps. Nasopharyngeal polyps tend to occur in younger cats, frequently affecting cats under a year of age. Some polyps are seen in the back of the mouth during an oral examination. The polyp may be hidden behind the soft palate but in many cases in is apparent that there is something behind the soft palate pushing it forward. In some cats with nasopharyngeal polyps, part of the polyp may penetrate the eardrum and grow out through the ear canal. This may be visible on inspection of the ear canal and eardrum. Most cats must be sedated or anesthetized to perform a thorough examination. Radiographs can help identify nasopharyngeal polyps and the use of a video endoscope may allow direct visualization of the polyp. A biopsy of the abnormal tissue, sent for microscopic pathological examination, will confirm the diagnosis. Surgery to remove as much of the polyp as possible is the most common treatment. De-bulking of the mass will generally improve the breathing and other clinical signs. In most cases, it is anatomically impossible to remove the entire polyp, and recurrence is common. Some cats will require a more serious surgery known as a bulla osteotomy. This operation involves creating an opening into to the middle ear cavity by way of an incision of the tympanic bulla (the rounded part of the skull just behind the ear). 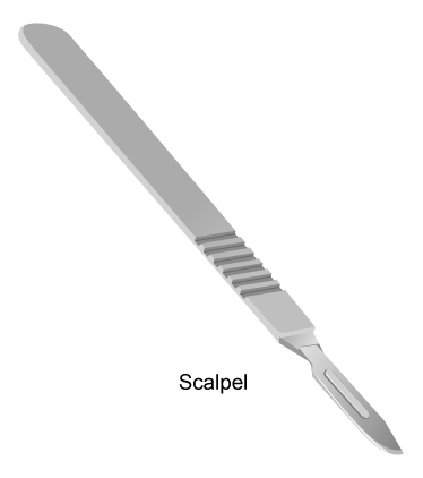 This approach allows removal of the source of the polyp. This is the most effective treatment for preventing nasopharyngeal polyp recurrence but it is a major surgical procedure and surgical complications are common. "Most cats enjoy a relatively normal quality of life following standard de-bulking surgery." Most cats enjoy a relatively normal quality of life following standard de-bulking surgery. While recurrence rates are high, many cats have few complications after surgery. In recurrent or severe cases, referral to a board-certified veterinary surgeon may be advisable. Your veterinarian will develop a treatment strategy based on your pet's individual needs.